Richard Pinhas is recognized as one of France’s major experimental musicians and is widely considered as a key figure of French electronic music as his German counterparts Ash Ra Tempel, Tangerine Dream, Cluster or Kraftwerk. 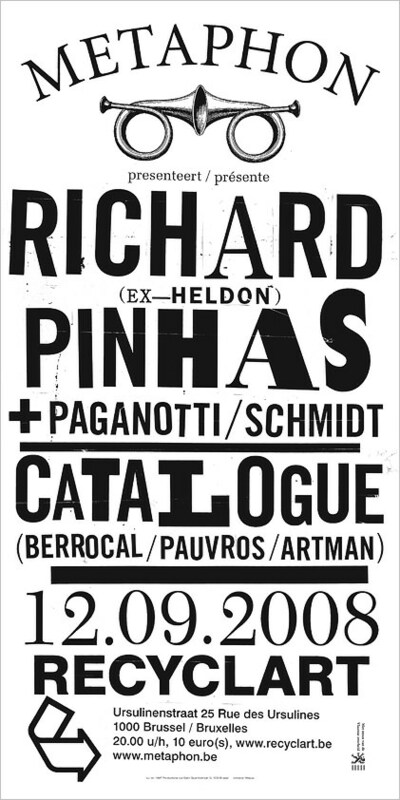 Ceaselessly innovative in a career spanning more than 30 years and mastermind behind the psychedelic/electronic band Heldon formed in 1974, Pinhas is also a world-class guitarist whose diabolic guitar work definitely earns comparisons with Robert Fripp. Later on Pinhas has also flavored his music with a degree of seething drama and raw intensity that elevates it to another level; muscular jamming, manic drumming and juggernaut noise riffs that could be considered as an early prototype of industrial music or electronic punk (eg. the album ‘Un Rêve sans Conséquence speciale’ from 1976). Current live performances fuse electronic music with guitar, drums, samples, and visuals/video projections. The line up will include Richard Pinhas on guitar & loops, Antoine Paganotti (of Magma fame, as his father Bernard) on drums, and Jérôme Schmidt on computers & samples. First ever Pinhas performance in Belgium!